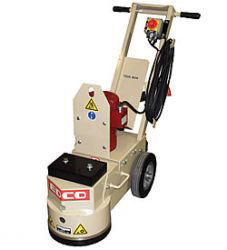 Edco 10″ SEC-1.5L Single-Disc Grinder is ideal for areas less than 1,500 Sq ft and residential applications. It helps removing mastics, sealers, grinding concrete, or smoothing rought surfaces, rain marks or trowel marks. 11″ Working width will grind approximately 200-250 sq ft per hour at 1/32″ with Edco Dyma-Serts. Round shroud gets tight against walls. The C06 and C10 is a coarse grade and one of the most popular, providing the maximum material removal rates. They are utilized for general grinding and the removal of trowel marks, high spots and rough sections on concrete surfaces. The average service life is approximately: 4 to 10 hours. The C24 is a medium grade stone that will result in lower material removal rates. 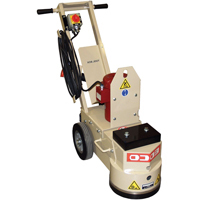 It is utilized for finer finish grinding of concrete and rough grinding on terrazzo and other types of stone floors. The average service life is approximately: 6 to 10 hours. The C80 is a fine grade stone that will result in still lower material removal rates. It is utilized for polishing concrete and medium grinding on terrazzo and other tyes of stone floors with a water/slurry mixture only. The average service life is approximately: 8 to 20 hours. The C120 is a super fine grade stone that will result in still lower material removal rates. It is utilized for final polishing of concrete and medium grinding on terrazzo and other types of stone floors with a water/slurry mixture only. The average service life is approximately: 40 to 75 hours. Application: Remove up to 1/8 inch material thickness. The larger the number, the finer the grain structure and usually, the smoother the resulting finish. 100 to 120 grit, red identification color, stamped “R” on pin shank. Use to remove fine swirl marks and normal grinding patterns from concrete and similar type surfaces prior to applying sealers, stains or preparing for diamond polishing. Usually preceded by the use of the SG24-2104 DIAM-A-TACH Grinding Block. 2.4 square inches nominal surface area per block. 0.45 inch nominal segment thickness. Includes SG24-1800 wedge, each. 30 to 40 grit, white identification color, stamped “W” on pin shank. General purpose, Omnitrix™ matrix formula delivers balanced productivity rates versus service life for both cured and green concrete, epoxies, urethanes and other, high abrasive-type materials. 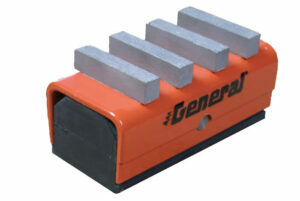 Usually preceded by the use of the SG24-2105 DIAM-A-TACH Grinding Block. 2.4 square inches nominal surface area per block. 0.45 inch nominal segment thickness. Includes SG24-1800 wedge, each. 40 to 50 grit, silver identification color, stamped “S” on pin shank. For removing rough swirl marks and normal grinding patterns from concrete and similar type surfaces prior to applying sealers, stains or preparing for diamond polishing. 2.4 square inches nominal surface area per block. Usually preceded by the use of the SG24-2106 DIAM-A-TACH Grinding Block. 0.45 inch nominal segment thickness. Includes SG24-1800 wedge, each. Dimensions: 2 inch x 2 inch x 4 inch. The SG24-2300 DIAM-A-TACH® Diamond Segment Grinding System offers an innovative solution for a wide variety of surface preparation job applications. The Omnitrix™ formulation allows the same matrix to be used on green concrete, high tensile epoxies, thin-film type floor coverings and fully cured concrete. Delivers balanced material removal rates and service life. This unique feature simplifies the proper matrix selection process and minimizes inventory stocking levels. The rectangular-shaped, diamond segments have significantly greater thickness when compared to competitive products. Delivers substantially longer service life and higher ROI. The housing is directional marked for proper orientation to eliminate the top layer of tails from being inadvertently removed. Secures tight with a plastic wedge. Use the SG24-2300 DIAM-A-TACH® Grinding System with General SG12 and SG24 Series Surface Grinders and popular models of competitive single and dual head surface grinders. 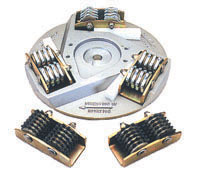 Available in carbide tipped 5 point flails for aggressive chipping action. Also, available in multi-point hardened steel flails for a fine finish or for breaking up hardened deposits of foreign matter or concrete floors.